Pretty much a month from when we arrived in Singapore we have made it to Thailand. I will miss the Roti Canai for breakfast in Malaysia but I will not miss the roads and pot holes. Thailand roads are so much better, we cycled 50km today with a dedicated motorbike and bicycle lane the whole way. The people are super friendly too. Both the boys have been hugged and had selfies taken with random people already. The girls from the local 7/11 came out of the shop and posed with both of the boys but I think they wanted to get a photo with Robert mostly. He has had about 10 people tell us how handsome he is already in Thailand. He obviously has the ‘Thai’ look. I think Patrick is relieved it is not him getting all of the attention. I would have thought the blue eyes would win the girls attention but they seem to be too interested in Robert to notice. Tomorrows cycle should be a good one. We will be cycling past some caves. We plan on stopping and exploring them. 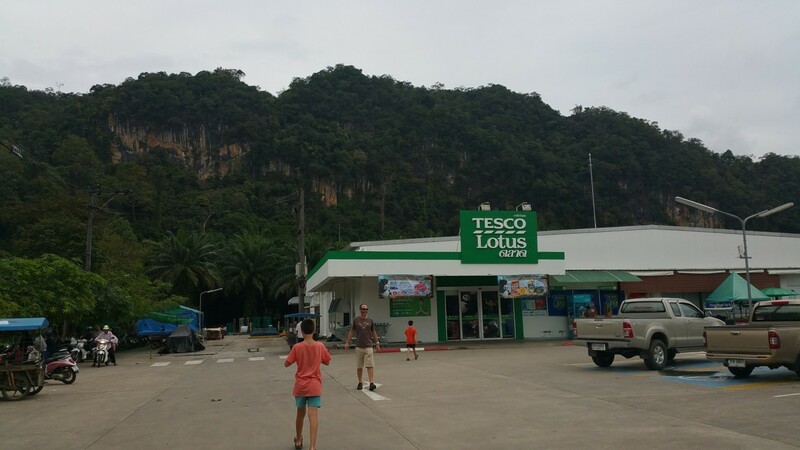 This area seems to have a lot of limestone cliffs as you can see in this photo of the local Tesco. Wow Robert film star now. Maybe a lovely romance through Thailand!